Is there a subgenre as thankless as the live-action family comedy? Studio animation aimed at families, even when it’s second-tier, can often claim some level of technical artistry. But so many movies aimed at slightly older kids—too old to demand exclusively talking animals, too young to just go see whatever PG-13 movie parents would rather watch instead—seem to take their cues from the worst of animation and the most middling of sitcoms. This is the process by which the genuinely (and interestingly!) harrowing middle school years become Middle School: The Worst Years Of My Life. Based on the first in a series of middle-grade novels co-authored by sentient publishing industry James Patterson and nearly enough collaborators to qualify as a writing room, Middle School follows Rafe Khatchadorian (Griffin Gluck) as he starts at a new school. 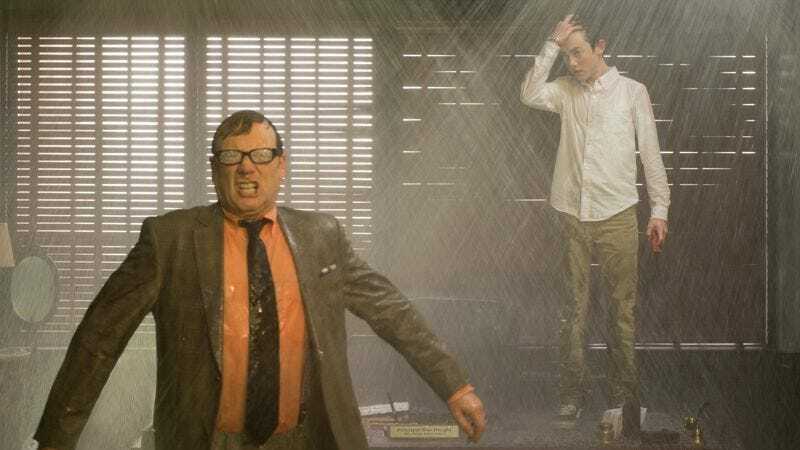 His creativity almost immediately chafes against the rule-obsessed Principal Dwight (Andy Daly), who attempts to discourage Rafe’s cartooning. Rafe, with a sidekick (Thomas Barbusca) in tow, retaliates by attempting to break every rule in the principal’s fastidious rulebook. Essentially, Daly plays the part of the crusty old dean and Gluck the part of the campus prankster, with Post-It Notes and hair dye as the tools of mild zaniness. Rafe is supposed to be put-upon by other students, too, but with his swooped-up, highlighted hair and glib, quippy manner, he’s too TV-ready to register as an everykid. Even his gawkiest moments, like when he stammers in front of his crush Jeanne (Isabela Moner), are as polished as a 22-year-old bar bro. At least he has a consistent style, though; Rafe’s nemesis Principal Dwight has been conceived as a catch-all of badness who quickly becomes ideologically incoherent. He’s introduced as rules-obsessed, but happily breaks laws. He’s uptight about students dressing too casually, but endorses a student council candidate who makes inappropriate remarks in front of the whole school, and in doing so makes inappropriate remarks of his own. He’s a global-warming denier for some reason. These contradictions and assorted bits of what the kids might call randomness don’t cohere into a set of comic ironies. They just sit there, showing what happens when a movie tries to ferret out the broadest possible cartoon laugh in every scene. By way of contrast, consider actual cartoon Principal Skinner from The Simpsons, where even his strangest quirks grow out of a clear set of obsessions and desires. Middle School has been scrubbed of anything like that. Though its title and general tone lament the stifling atmosphere of the years between childhood and full-fledged teenhood, the movie misses the animal hostility and physical awkwardness of genuine tweens. (It also misses any sense of which middle grade these kids are in, and what they learn in school beyond the 30-minute homeroom period that seems to take up their whole day.) Even its bully character is clean-cut and largely nonthreatening. This is a Disney Channel-style universe where little kids can drive cars and the truly bad behavior stems from adults. Director Steve Carr has turned several comic actors into birthday-party entertainers, having worked with Eddie Murphy, Ice Cube, and Kevin James on some less illustrious moments in their filmography. For Middle School, the focus is on kids themselves, but Carr manages to get some lower-level comic actors in on the act by roping in Daly, Rob Riggle, and Retta. Retta comes closest to acquitting herself with dignity, while Riggle is particularly ill-served as the boyfriend of Rafe’s mom (Lauren Graham). The character is written as so transparently awful that precious few of his jokes land properly (at least for audience members over the age of 10) and anyone in the world of the movie who doesn’t notice his outright villainy winds up looking stupid. Maybe the movie itself is distracted by engineering its own bit of misdirection, in the form of a twist that could be described as Sparksian. (Did Patterson lose a bet to Nicholas Sparks, or is he just trying to out-mawk the master of cheap sentiment?) Middle School’s serious moments try to engage its target audience beyond pandering song cues and kids-rule moralizing (in this case against standardized tests). But apart from the unfortunate Sparks parallels, this subplot is also up against a style so garishly cartoonish that the movie’s occasional forays into actual animation, to portray Rafe’s cartoons and fantasy life, feel like a blessed relief. If this is the best that tweens can get, they ought to either turn back to those cartoons or go ahead and start sneaking into the forbidden stuff.